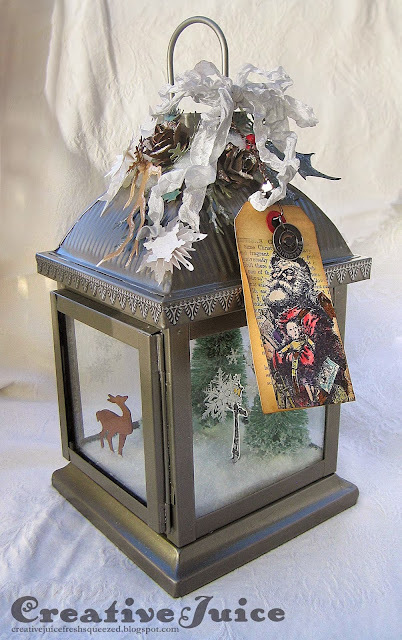 The trees are from Tim Holtz and I sprayed them with Pine Needles Distress Stain to color them. I also liberally sprinkled them with dry Rock Candy Glitter to frost them up. I love that glitter! The ground I formed from air dry clay. After the clay was dry I spread a layer of gesso on it to glue the trees etc. down as well as the fake snow I sprinkled over everything. 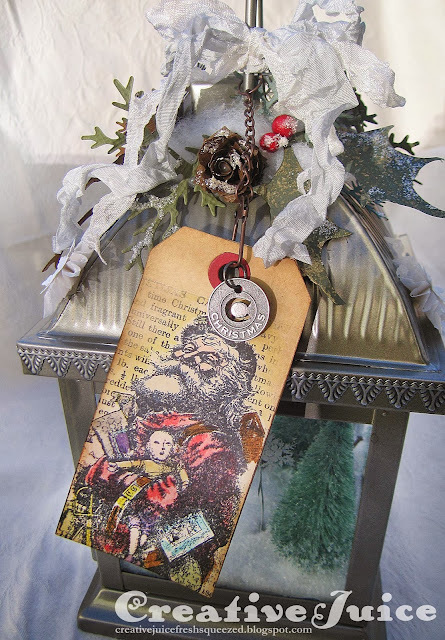 I stamped the Father Christmas image in archival ink and then "watercolored" it using Distress reinkers and pads plus some Picket Fence Distress Stain for the hair and beard. The stamp is an older Inkadinkado one that I've had for a long time. 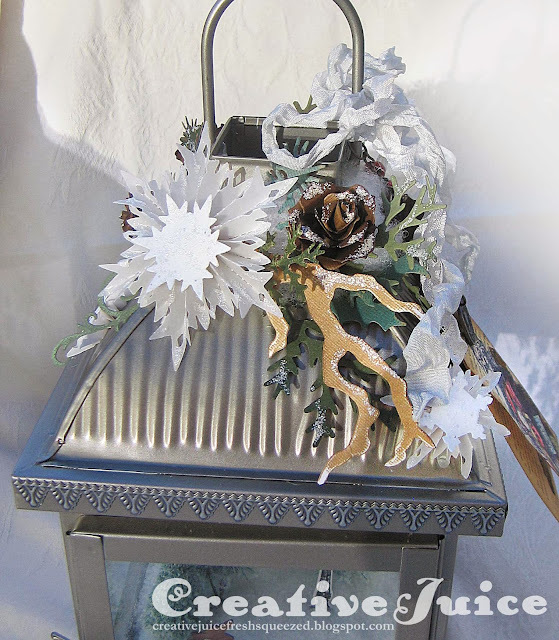 …snowflakes (cut from vellum), pinecones and lots of greenery. 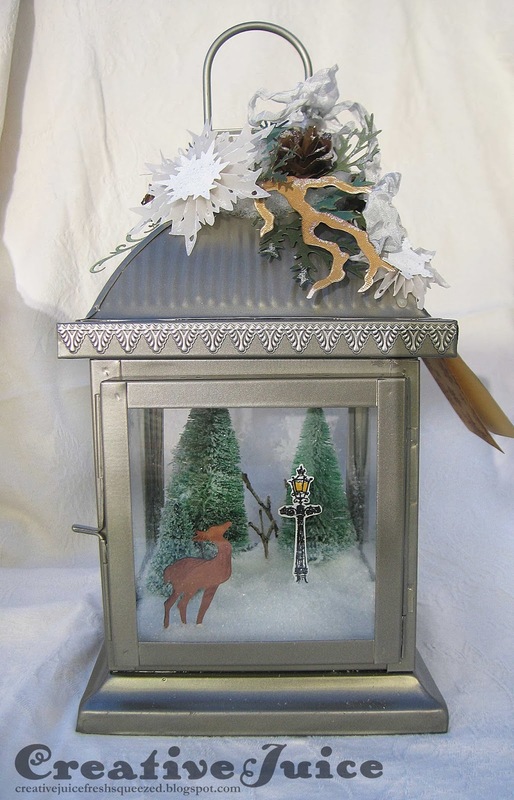 I first hot glued a bit of acrylic stuffing around the top of the lantern so I'd have a base to support the pieces as I glued them on. I hope that you feel His love, peace and blessing this week. Merry Christmas!!! Most of the supplies I used to create this project can be found at Inspiration Emporium. Follow the links below and use my code JUICE to save 10% if you go shopping. Thanks! So fun ... love all the Tim goodness going on ... just beautiful !!! Lisa, this came out gorgeous! I have yet to play with my die, think I will give it a shot, thx for inspiring me!